Eacero is very lightweight and easy. 28 seconds is what you need to customize your logo and colors. 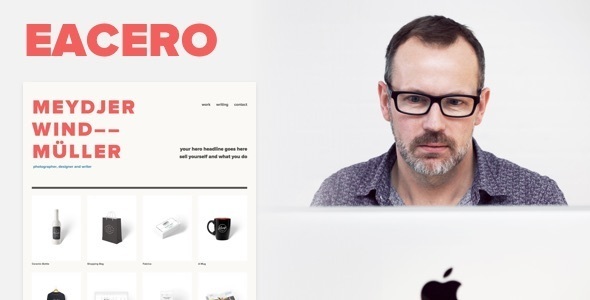 Eacero was designed for creative dudes who have ZERO TIME to learn how to use a new framework/toolkit/plugin. It follows all WordPress standards. You control the theme, not the opposite. Optional Homepage Big Logo W3C Valid Markup Well Commented and Prefixed Code 100% GPL Clean HTML5/CSS3 Clean Modern Design Easy to use Documentation Included 100% Fully Responsive Portfolio Page and Portfolio Item Template 100% Retina Ready CSS3 Animations Typekit Option, with Google Font callback SEO Optomised Speed Optomised Color Options Color Palette Included Text Logo Live Editor 4 columns footer layout Build a professional portfolio now. Eacero — Personal Portfolio Theme has been tested with browsers IE9, IE10, IE11, Firefox, Safari, Opera, Chrome, Edge.